This is an exciting week for jentertaining. My Joss & Main event is up, so be sure to check it out and pick up a few of my favorite entertaining classics. When Joss & Main asked me to be a part of their “Curators Collection,” I thought it would also be a great chance to give you a little tour of my small corner of the Upper West Side. I moved into this studio apartment three years ago. It was my first time living alone, which also meant my first opportunity to decorate and make a space my own. I love clean, open, and fresh spaces…and even with limited square footage, I still wanted the flexibility to entertain friends. I didn’t buy all of the furniture the moment I moved in–I took a few months to see how I would use the space. The result is a place in which I can relax and entertain without too much effort. 1. Expandable Dining Table: go from “breakfast for two” to “dinner for four” without eating up precious real estate. 2. Bar cart: I am free to move this around the apartment to accommodate a number of guests. 4. Nesting Tables: A coffee table doesn’t work for my living room, so I use nesting tables instead for added serving surfaces and flexibility. I can place all three in front of the couch, or break them up around the living room. I would love to hear and see how you set your home up for entertaining. Shoot me an email at jen@jentertaining.com with your story and pics…you might just see your place featured in an upcoming jentertaining post. All photographs by John Dolan Photography. No matter how carefully I prepare for entertaining it seems that most people end up in the kitchen which is never very specially prepared. Great job on the apartment. I love all of these tips! I need all of those! 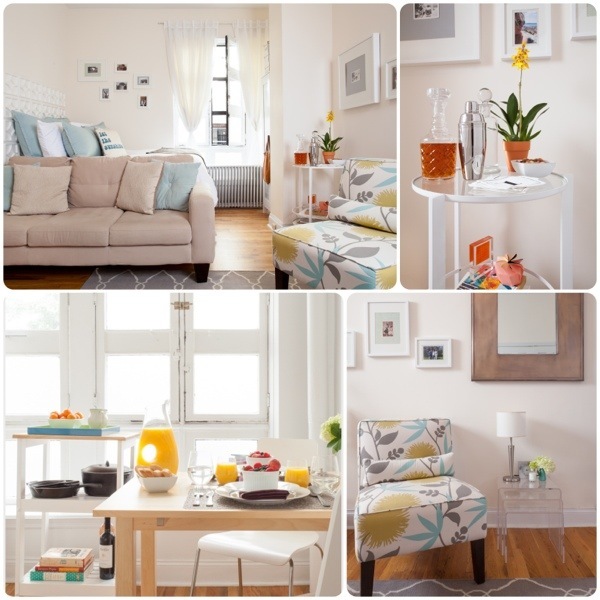 Next time I move I am totally upgrading to the tables with leafs, a bar cart, trays, and nesting tables! WOW! Your apartment looks amazing. I can just imagine friends smiling and laughing with good food and wine in hand. A true sign of a great party! Thanks, take your time and build little by little! Beautiful apartment Jen! I love how light and sunny it is. I was also so excited to see your Joss and Main collection – great picks! Thanks for the love Haeley. Was thrilled Joss and Main asked me to participate. I missed this one somehow…the pictures turned out amazing!